I have waited a week to comment on the last episode of Call the Midwife. I don’t want to spoil the ending for anyone…but wasn’t it brilliant? We witnessed a miracle of answered prayer and saw a ‘prayer blanket’ in action. I got very excited. I have knitted prayer shawls for years. I have given and been given them. I have knitted my way through a whole theology degree and attracted some weird looks from many at college who took the time to ask ‘what are you knitting?’ but then didn’t know what to do with the answer. The point of a prayer shawl is to knit it with someone else in mind and to pray meditatively for that person every time you pick up your needles. Shawls are easy to knit: the basic purl 3, knit 3 makes a lovely stretchy basket weave that folds itself around you beautifully. The power of a prayer shawl is not in the shawl: it’s in the love and the prayers that have gone into the shawl. The gift of a shawl says, ‘I want you to feel enfolded and wrapped up in the love of God’ or ‘I have knitted into every stitch a desire for your healing or blessing’. So last week, when Chummy’s distressed friends spent a night of silent prayer, knitting and stitching together a blanket which was then taken to drape over their unconscious friend, we saw a miracle in action. The miracle was not the blanket, the miracle was the ‘together love’ and ‘together prayer’ that rose up from the community for their stricken sister. I was on the edge of the sofa with excitement! A mainstream TV programme talking about the power of silent prayer and creativity. If you want to know more about prayer shawls, the best book on Prayer Shawls is Knitting into The Mystery by Susan S. Jorgensen and Susan S. Izard. 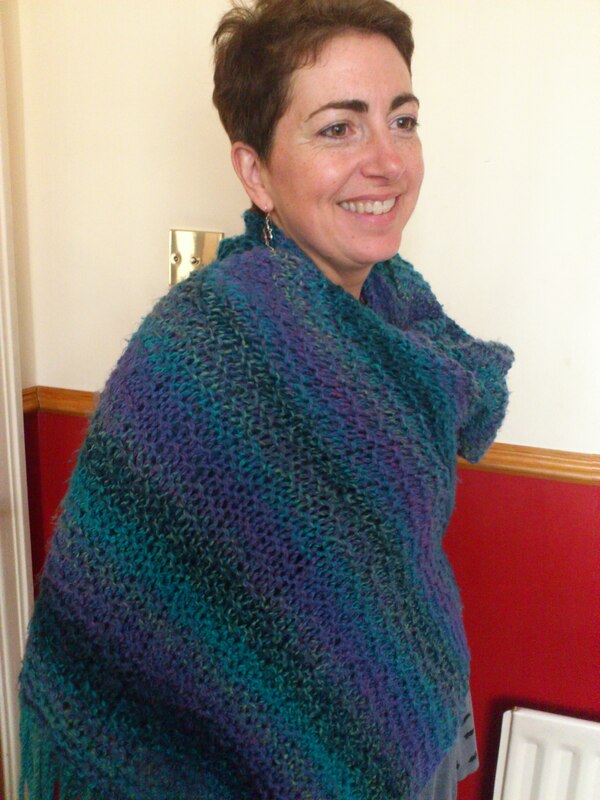 It only has one pattern but it has lots of prayers and examples of how shawls can be used. Here is my favourite prayer from this book. Warning: I can rarely read this without crying…. Even as the memories escape you. Even as you lose their faces and their names. Even as I struggle to let you go. What to do with a memory? I loved this piece. It may seem too niche or weird for St Johns, but fits right into many of the rural constituencies/churches/congregations we deal with via the Arthur Rank Centre. I’ll FB you about this, too. Hi Martin, nice to hear from you. I am happy for you to use it in either of those ways or if you’d like me to tweak it slightly I’m happy to do that too. Yes, it was a wonderful episode! I hope patchwork quilts work in the same way. When we left Delph I was given a collection of matching ‘blocks’ to work into a quilt for myself and someone had written on the back of theirs: “Love in every stitch”. This is wonderful! Loved it. Even though I haven’t seen the episode. Can you believe that I have never heard about prayer shawls before! I think I might even have to share the idea with my knitters and spinners group 🙂 I’ll keep you’d stead on the response. Prayer shawl ministry is really big in the States, there are alot of book and prayers published there some of which veer towards ‘new age/dream-catcher’ kind of spirituality but there are some gems of patterns, ideas and prayers that are published. The idea is that you give a written prayer along with your shawl, one that has formed or you have prayed as you have worked. Some churches have a ministry to local hospitals providing shawls for prem babies or bereaved mums or to wrap around still borns. Similar ministry is possible if you have connections to a hospice. Hi Sheila – I love this and will take it to our knitting and craft group too. I will buy that book but What size needles did you use and what type of wool?. Hi Jan, you can use size 8 or 9 needles. Size 8 will make your pattern a bit more dense. I use chunky wool. The pattern is K3, P3 every row, Always begin each row with knit 3 and end with knit 3. Cast on any multiple of 3 depending on how wide you want your shawl eg 57 on 9mm needles or 63 for 8mm. The pattern that results is called a kind of moss stitch or seed stitch. Have fun! ps. I’m AMAZED by the response I’ve had to this post! Creativity combined with prayer is clearly a potent mix. Hi, I’m from the US. The official prayer shawl ministry website is http://www.shawlministry.com. Suggested needle sizes are, I believe, only in US sizes but there are online conversion charts if you need the metric system. Just Google. I use larger needles (size 13 US) and chunky yarn, such as Lion Brand Homespun — not sure if you have it over there. My church has a prayer shawl ministry. We knit or crochet shawls and lap blankets for church members who are ill, bereaved, and for those undergoing medical treatment such as chemo. The only stipulation re/yarn is that it must be machine-washable and dryable. Oops, just realized I am replying to an old post.